Is it easy to be a vegan nowadays? Although the plant-based movement is rising, there are still many problems that vegans have to encounter almost every day. And these are not only food-related issues. 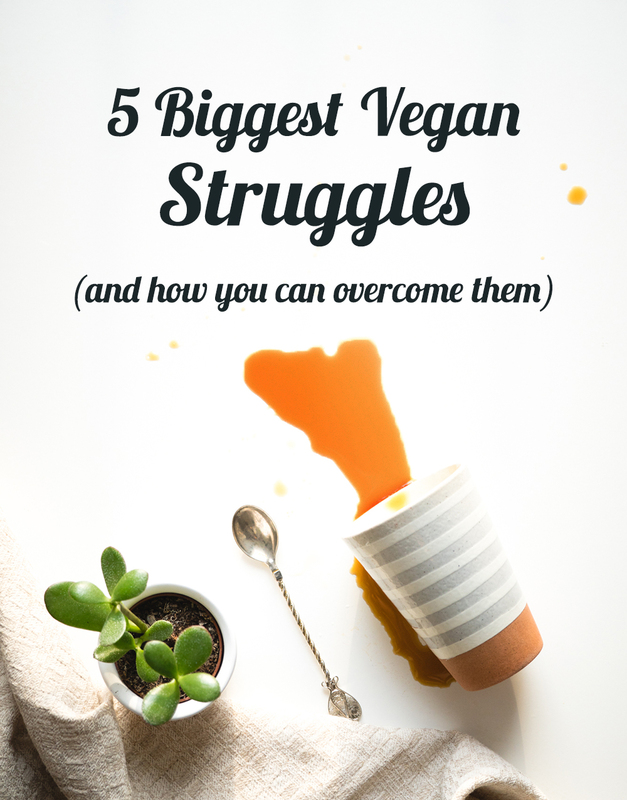 In this article, you’ll discover 5 biggest vegan struggles and you can overcome them. As a vegetarian for 6 years and vegan for 2, I’ve talked to a lot of plant-based eaters. 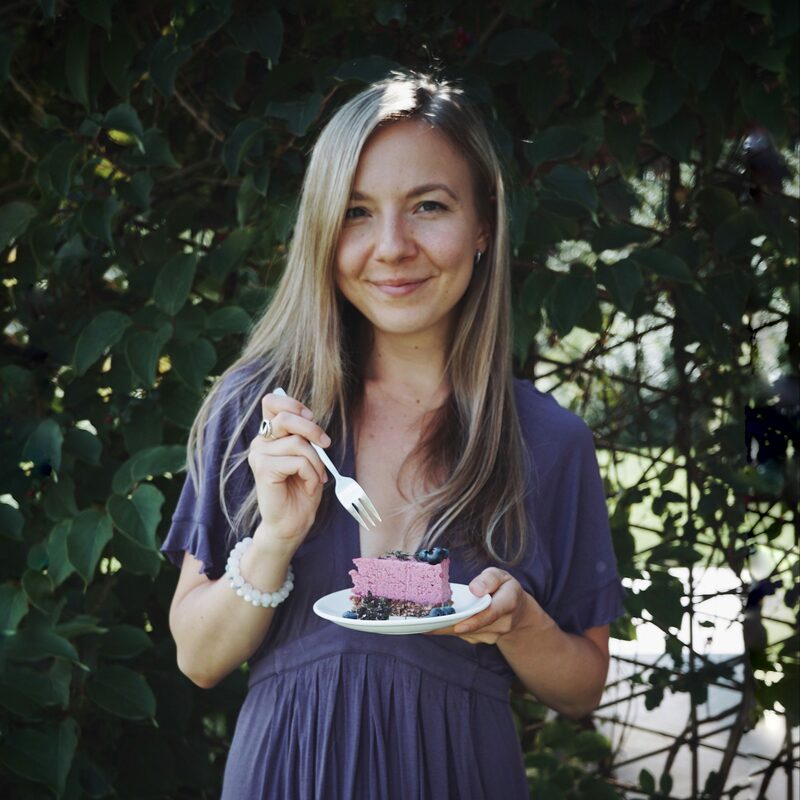 Whether it’s a friend of mine, my blog reader or someone on the Instagram asking a question, over time I noticed that there are a couple of problems that keep repeating within the vegan community. 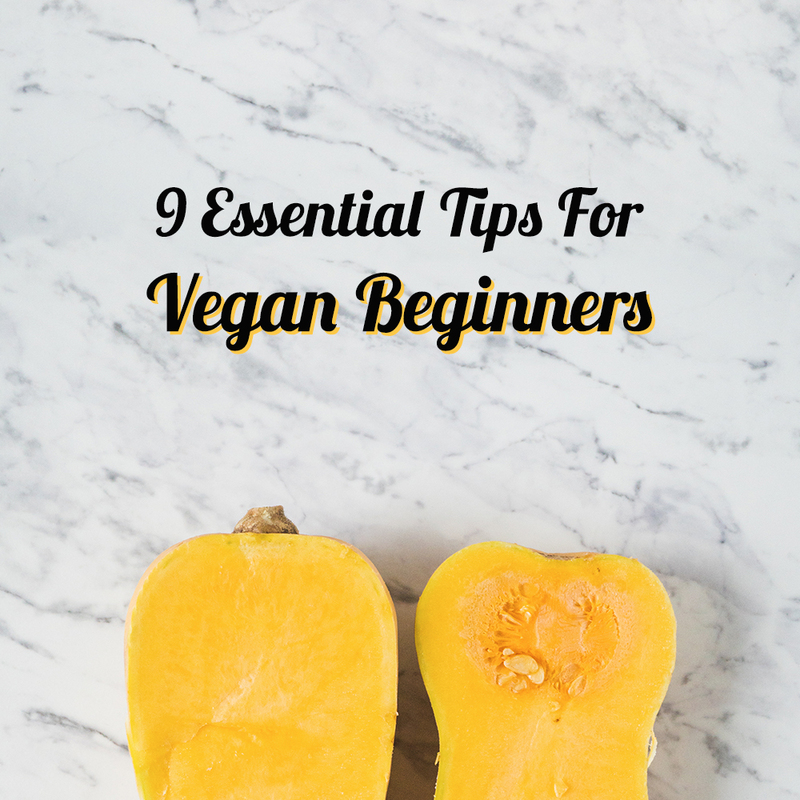 So in this post, I’ve collected 5 of the biggest issues that vegans struggle with and for each struggle I’ve given you a couple of options for overcoming it. This is going to be a long post so make sure you grab a cup of coffee or tea on the way! After spending time talking to lots and lots of vegans on my email list, I’ve come to a conclusion that eating out is the number one struggle for plant-based eaters. Eating out is a broad term so I’ve divided this section into four more specific scenarios – eating out at restaurants, social events, dealing with plane food and eating out when traveling. Do you have a struggle with eating out too? Although the situation is slowly getting better, there are still many restaurants that offer zero or just a few vegan options. It can get tiring to eat the same single vegan meal over and over again or order fries and plain salad because they don’t have any other vegan options. But there’s more to it. There are some restaurants which don’t even know what’s in their food – they can’t tell you if it’s vegan or not! Or sometimes the waitress has no idea what “vegan” means and she’ll just assume you’re a vegetarian and bring you a big slice of cheesy margarita. So what you should do? Here are some tips. If you have a choice to pick out the restaurant, use the app Happy Cow to find vegan restaurants (or restaurants with vegan options) nearby. If there are no vegan restaurants in your city, try to pick out an Asian restaurant as they tend to have a lot more vegan foods than other restaurants. If your friends have picked the restaurant, try to find its menu online to see if you’ll have any options. Maybe they have a website or a Facebook page where they share their menu. If you can’t find the menu, make a quick call and see if they have any vegan options. If they don’t know what “vegan” means, politely explain to them that you don’t consume any animal products. If they don’t offer anything vegan, ask if the chef could fix something for you (usually they’ll be happy to do that!). 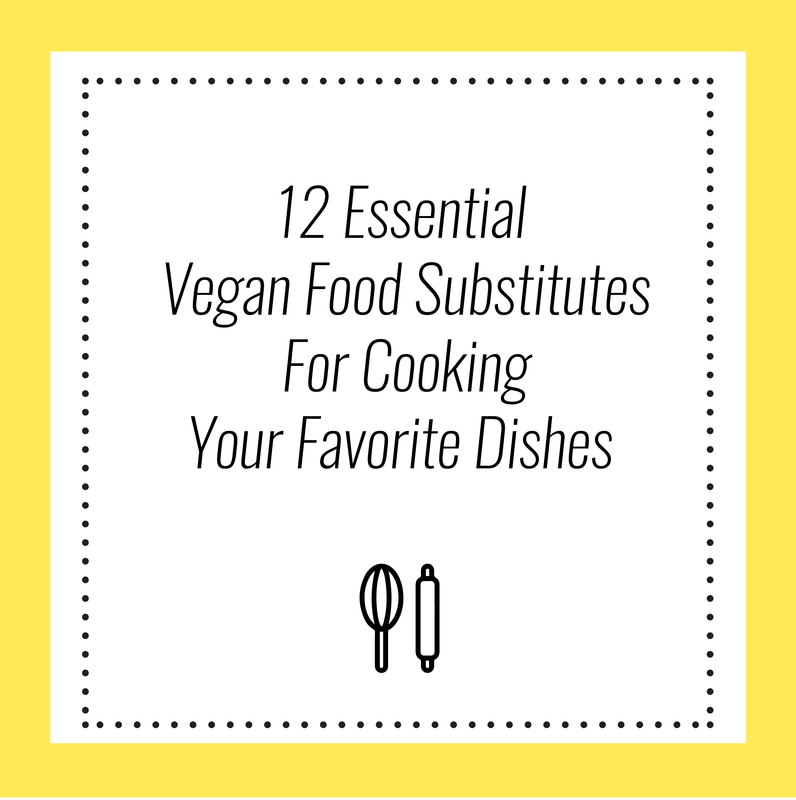 Tip #3: Don’t forget about the substitutes! Most restaurants have vegetarian options, which can easily be made vegan. Ask if the dairy or egg can be removed from the dish or replaced with a vegan ingredient (for example, they can replace butter with oil). Most restaurants offer many different sides that are vegan. If you order sides like rice, beans, and veggies, you can get yourself a pretty balanced meal. If you know that the options will be very limited (for example, if you’re going to a steakhouse), eat something beforehand and order a drink or a snack when you’re at the restaurant. 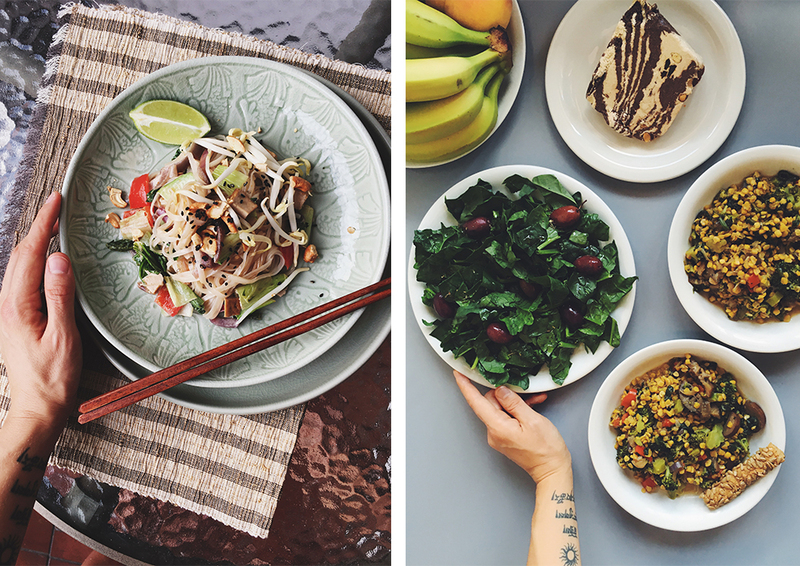 In the photos below: dining out at vegan restaurants in Munich, Germany and Chiang Mai, Thailand. 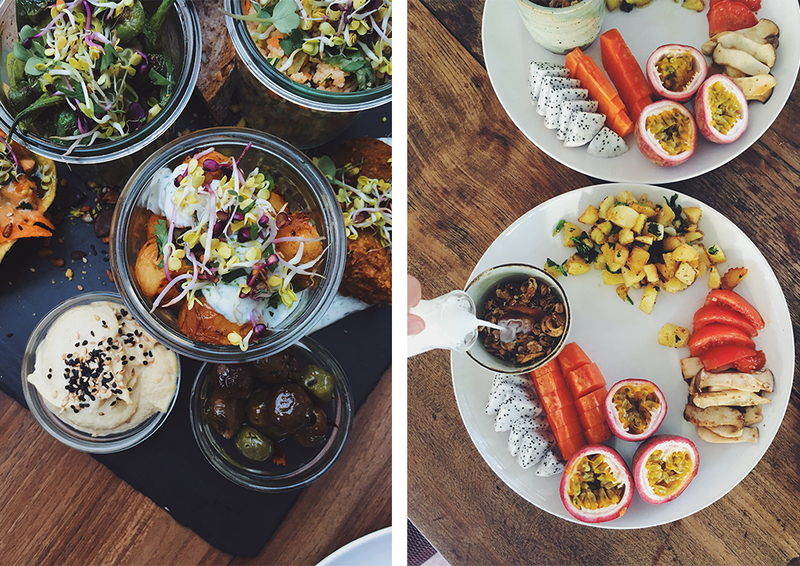 Those two cities offer the most amazing vegan food! When it comes to eating out, the next on the line are different social events. Whether it’s your friend’s birthday party, a family gathering, concert or a BBQ, the available vegan options can hit a sad number. I’ve been in situations like these a lot and in my early vegan days, I was left with an empty stomach. So what should you do? The best and the only thing I recommend is to prepare and take delicious vegan food to the event. Trust me, it’s a lifesaver. First, you’ll get to eat what you like. Second, no hunger or desperate searching for hummus. And third – if your food is delicious enough, you might brake some stereotypes and inspire another event’s quest to try a vegan diet! 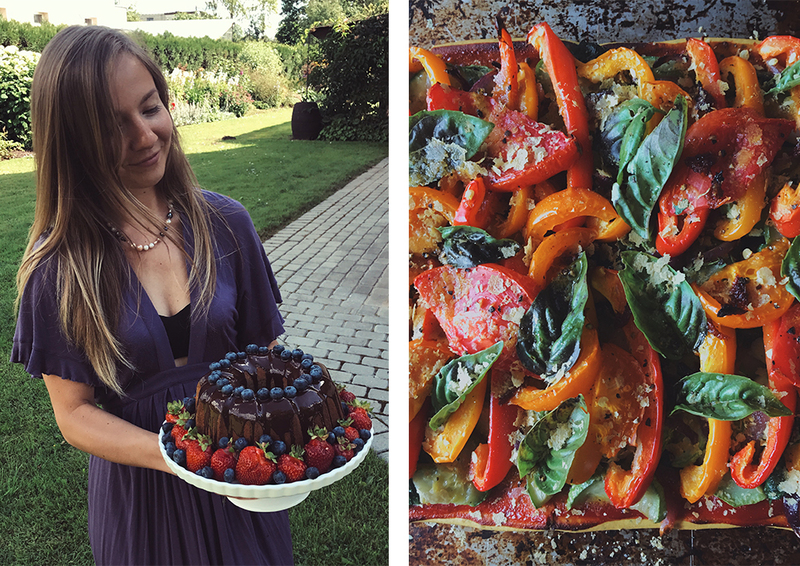 In the photos below: me just after baking a big vegan peach cake for a birthday party and serving vegan pizza for a family gathering. Even for non-vegans the plane food sometimes can be a challenge. It’s often tasteless and highly processed which leaves you with a huge energy crash afterward. And vegan options? There are a few companies that allow you to pre-order your plane food and they might have some vegan options. But most of the times – forget about it. I’ve had a lot of rice-only meals on the plane until I got tired of it and started to prepare my own flight-friendly and nutritious food to take on the plane with me. So, yes – prepare your own flight-friendly food! What’s a flight-friendly food? Things that are easy to eat, don’t need to be warm, don’t need a huge package to carry with you and don’t leave you feeling stuffed or bloated. My favorite homemade healthy plane foods are avocado sandwiches, wholesome wraps, berry-packed muffins, store-bought fruit and vegan nut & seed bars. Adjust them to your liking! 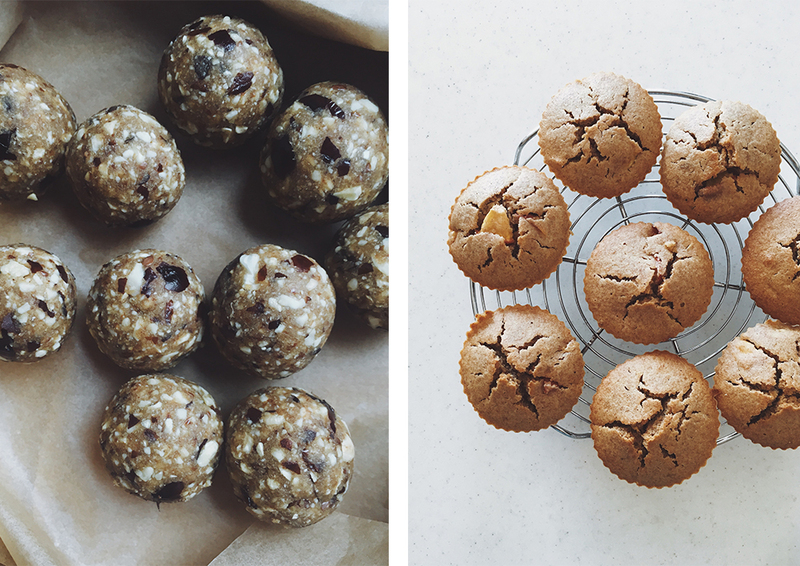 In the photos below: packing for a flight – nut & date energy bites and nectarine muffins. I’ve traveled quite a bit to say that some are more vegan-friendly countries (and cities) than others. For example, in my recent trip to Munich, Germany, I had absolutely no issues with finding vegan food. There were plenty of vegan restaurants and delicious options even in the local markets. But when I went to Crete island, Greece, I was getting by with lots of bread and pasta. I usually found only one or two vegan options at the restaurants and even those usually were plain pasta with tomato sauce or roasted veggies. 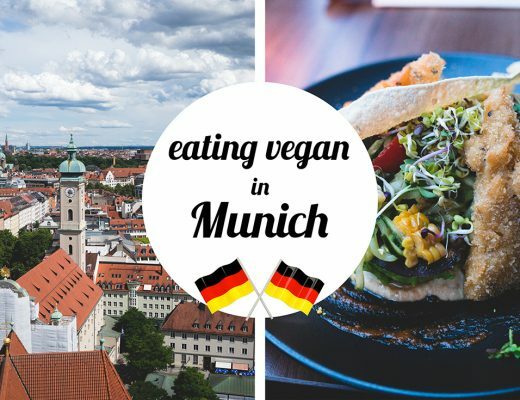 Just Google “guide to eating vegan in Munich / Crete / London (or any other cities)” and you should be able to find some articles written by other vegans who have already been to those places and done their research. Usually, these guides are very helpful and can save you tons of time doing all the research by yourself. I’ve saved a lot of time and unnecessary stress by using these guides. If you end up in a place where even no guides can be a help and there’s literally no place to go and eat out, visit the local markets, buy authentic ingredients and cook your own food. It can be a whole adventure! To be able to cook, make sure you book a hotel or Airbnb that has a kitchen with the essential appliances – stove, oven and so on. That’s what I did when I went to Crete. I cooked a lot of food myself and experimented with the local ingredients. 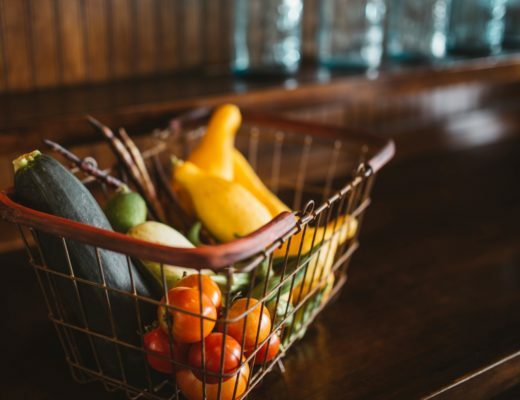 So remember – eating out as a vegan can be a struggle but there are many things that you can do to avoid an empty stomach and awkward situations. 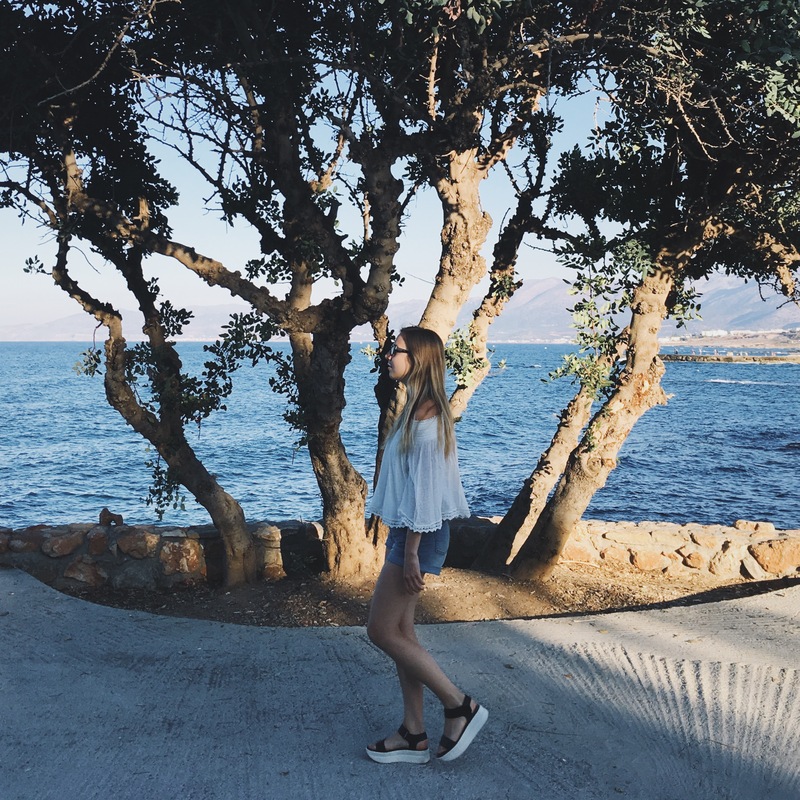 In the photos below: cooking my own pad thai in Chiang Mai, Thailand and serving a homemade lentil stew with salad in Crete, Greece. Social pressure is another big one for vegans. Let’s be honest – the media is still full of silly stereotypes about plant-eaters. So we can’t really blame anyone for judging vegans. 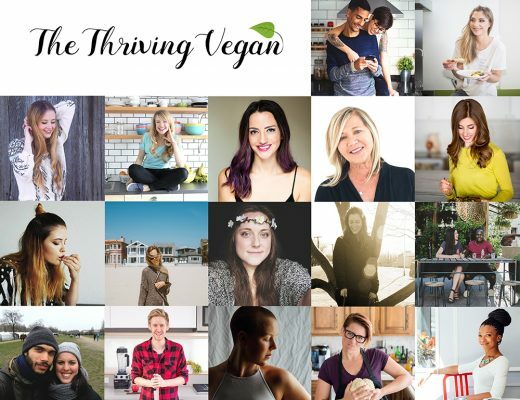 As the vegan movement is growing and there are more and more success stories about the vegan diet and lifestyle, this situation should change soon, I believe. All it takes is to spread the right information. Social pressure is a wide topic, just like eating out, so I’ve divided it into 4 smaller sections – feeling the pressure from your family members, trying to explain why you’re a vegan, accidentally confronting people and replying to silly questions. Why is your mom worried and judgmental after you go vegan? Because she cares about you and your health. Just like I said before – there are tons of stereotypes that vegans are forever hungry, weak and nutrient deficient. You need to break those stereotypes. How? Here are a few tips. Send your mom photos of your delicious vegan meals. Tell her all about your achievements – whether it’s related to sports or any other activities. Show her that you feel good. But be honest. If no one wants to cook vegan meals for your family, be the one who cooks for them! I’m lucky enough to have a mom who’s very open-minded. Although she was skeptical in the beginning, soon after when she saw my passion for a plant-based lifestyle, ate my delicious vegan meals and saw me running a half-marathon, she dropped the doubt. Even better – now she’s mostly plant-based herself! And the last thing you want to do is to judge your family members or be defensive – it doesn’t work. These two destructive strategies can even lead to the other end – your family will become even more judgmental and disappointed. 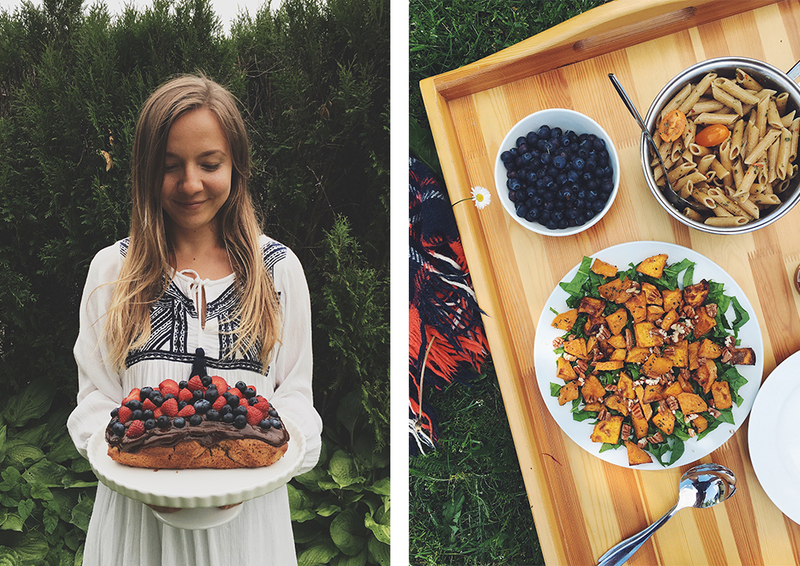 In the photos below: me with a vegan cake (and lots of berries) and a family picnic setup. Delicious for everyone! Have you ever tried explaining to someone that you’re a vegan and all of a sudden, they get defensive, upset or even aggressive? Did you do something wrong? Not really, but people tend to get very sensitive when a vegan topic is brought up. Why? Well, imagine how you’d feel if you were a true meat eater and there’s a vegan telling you about all the animal suffering and environmental crisis and how these issues made them go vegan. Fundamentally, we all can relate to these problems. Sure, there can be people who’ll say that animals don’t suffer and so on. But most of us, even the biggest meat eaters, deep down know that eating meat involves suffering and cruelty. That’s why people might feel guilty and become defensive when you explain to them why you’re a vegan. I’ve had a lot of situations like these and they make me feel very uncomfortable. Sometimes I’ve even felt guilty for making someone else feel guilty. So how can you explain that you’re vegan without offending anyone? First of all, you need to take the pressure off your shoulders. When you’re a single black sheep in a social event, standing up for your values can be challenging. You might feel awkward and avoid any discussions about your diet or lifestyle. To overcome this, take a moment and remember your values and the motivation behind them. Being a vegan is a big commitment and you had to have a big motivation and willpower when you made a switch towards a plant-based lifestyle. What made you do it? Was it your health, the environment or ethical reasons? For me, it was mainly the environment and animal suffering. Every time I remember the movies I’ve seen or the terrifying things I’ve read that made me go vegan, I have such an easier time standing up for my values and feeling proud of what I do (and you should too! <3). Next, when telling to people why you’re vegan, focus on your experience. Don’t say how the vegan diet can improve their health. Instead, say how the vegan diet has improved your health. By doing this, you’ll avoid people getting defensive about their lifestyle choices. At the same time, if you’re bringing out the positive (for example, vegan diet improved my energy levels, my overall health and I even lost some weight at the same time), it’s very likely that people around you will become open-minded (after all, who doesn’t want to have all those health benefits?) and inspired by your actions. 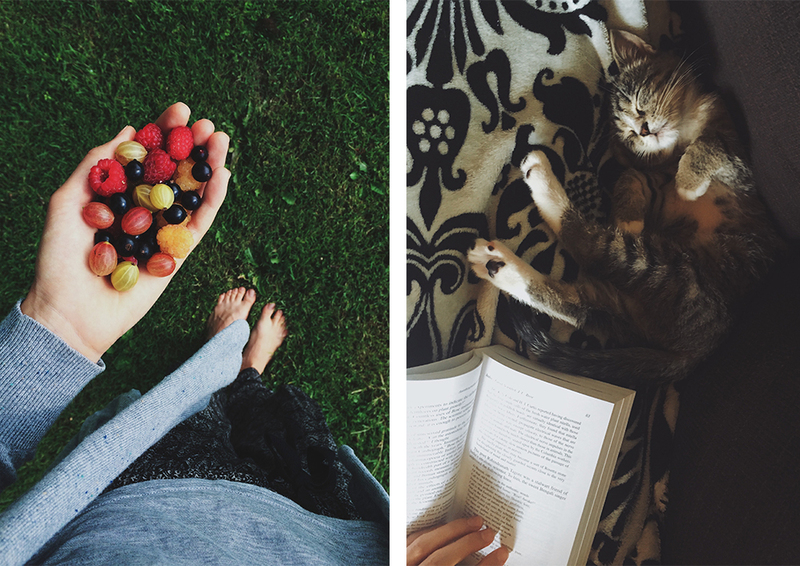 In the photos below: enjoying vegan superfood that’s available to everyone – berries! And having a lazy Sunday with my cat Coco. Ethical aspects of veganism are the ones that speak deeply to me. Another annoying thing that vegans run into is accidentally confronting people because they can’t eat something that they’re offered. I always feel the worst when this situation comes up in family dinners (especially when I’m introduced to new relatives). Imagine if you’re arriving at your boyfriend’s aunt’s house and the table is filled with all kinds of foods – mostly non-vegan. You can see that the aunt has been cooking the whole day, putting all the love in the foods that she’s making. Now she’s offering you a piece of her signature cake that’s filled with dairy and eggs. How can you say no?! You can’t leave the poor aunt feeling bad and disappointed! Yes, you can and sometimes there’s no other choice. Remember – you can’t please everyone. Period. There are tons of people in the world who can’t or won’t eat something (not only vegetarians, vegans but also all the people with allergies) and others have to accept it. Just like we’re accepting them. I know, it’s easier said than done. I’ve had times in the past when in order to please the person that’s cooked for me and show my appreciation, I’ve tasted a tiny bite of their non-vegan cake. But instead of feeling guilty about my slip-ups, I’m moving on and learning from my experience to next time take better decisions that are alight with my values. To take things to a more positive perspective, there are a few things you can do to avoid confronting people in the first place. Most people will be happy to cook something vegan for you! Make them a special plant-based meal to show how delicious a vegan food can be. I’m sure there is at least something vegan on the table. Even if it’s just plain potatoes or green salad! Focus on the food that you can eat and tell the host how delicious the food is. Just like I said before – judging doesn’t help. Instead, focus on what’s available and show your appreciation! Yes, people will ask you loads of silly questions. That’s unavoidable. I know, it can get very tiring. But there are plenty of catchy answers you can give to these questions! Diane from PlanteousVeg has collected the most asked silly questions that meat eaters ask vegans. I absolutely love her witty and smart answers! 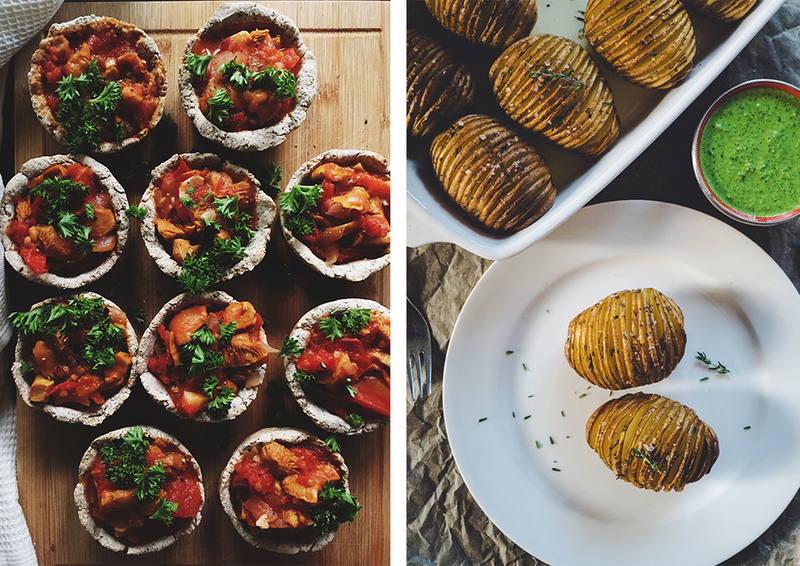 In the photos below: mushroom baskets and Hasselback potatoes – perfect vegan comfort food to bring to your family events. Although mostly common with vegan newbies, even a few long-term vegans sometimes crave the same old flavors of cheese, eggs, and grilled meat. If we’ve grown up with these flavors, it’s only natural that we crave them. Fortunately, there are many excellent (and cheap) vegan food substitutes that you can use to replace necessary ingredients or get the flavors you want in your vegan foods. 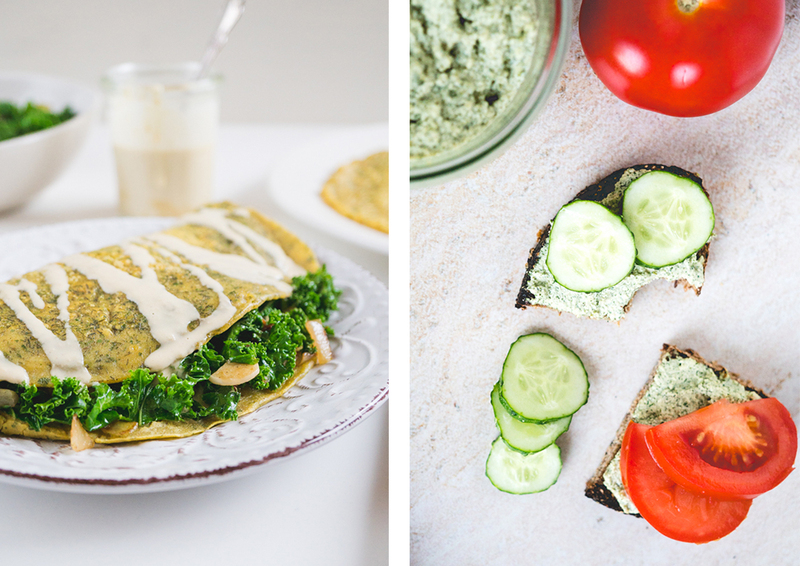 And, yes, even vegans can make their own cheese that tastes like cheese (check out this vegan Parmesan recipe or this vegan cream cheese) and make a filling eggless omelet! kala namak (aka black Indian salt) for an egg flavor. If you want to extend your plant-based diet and move towards a vegan lifestyle that involves choosing vegan clothing and shoe brands, you might experience some struggles. Indeed, finding brands that make beautiful vegan clothing, shoes or accessories can be a pain. When I tried to find new vegan shoes a couple of years ago, the situation was quite devastating. I found either quite ugly vegan shoes or overly expensive ones. Luckily, the situation has changed dramatically and there are more and more brands that offer vegan options or make 100% ethical and vegan products. When it comes to clothing, almost all of your local stores probably already offer clothes that are mostly vegan (except fur or leather stores, of course). Cheap accessories in big stores ­– shoes, belts or bags – are also mostly vegan but their quality is usually terrible. Although the clothes and accessories in the big brand stores (for example, H&M) are cheap, these companies compensate by choosing a cheap labor (have you seen the documentary The True Cost?). Of course, not everyone can afford brands that are both cruelty-free and ethical. In the list below I’ve collected some of my favorite vegan & ethical brands. Some offer expensive but some cheap products. Choose the ones that are the most suitable for you! I was so happy when they launched their non-animal collection! I’m a true fan of Vagabond. Also, big sites like ASOS offer a lot of vegan options for shoes. But their clothing and shoes are not always produced ethically. Still, you can find some gems there. If you know any other vegan clothing, shoe or accessories brands that should be on this list, feel free to share them in the comments section! In the photo below: my Vagabond platforms from their non-animal collection. These babies have survived many trips & years of wearing and they’re still doing great! The last biggest struggle for vegans is finding good vegan beauty brands. Although there are many cruelty-free ways how to test cosmetics, many big beauty brands still raise their hand for cruelty and test their products on animals because it’s cheaper. Some of the biggest beauty brands that still test their products on animals are Victoria’s Secret, Maybelline, Makeup Forever, Estee Lauder, Clinique, L’Oreal, M.A.C and many more. Luckily, more and more countries have decided to ban animal testing. The whole European Union has banned it as well as Norway, Israel, and India. But still, countries like USA, Japan, China, Australia, France, Canada, the UK, nd Germany allow testing on animals. So how you can find good cosmetic brands that are cruelty-free? 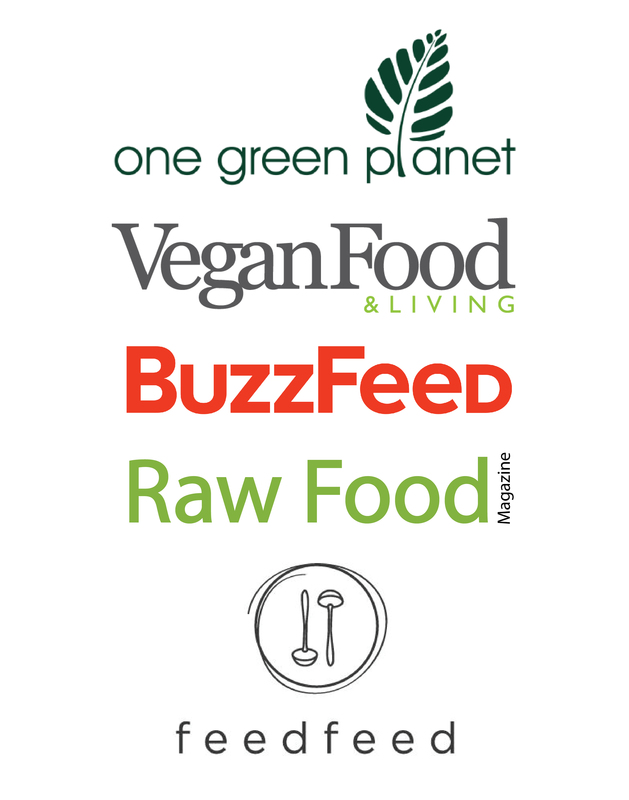 Most brands that are cruelty-free and vegan, clearly states it on their webpage. Look for the “About” section and see if you can find some information. If not, feel free to email them and ask! I’d suggest you start by looking at some of the small local cosmetic producers. I’ve found that during the last couple of years the small ethical cosmetic brands have bloomed tremendously. In my home country Latvia we have many small cruelty-free brands. See if you can find any in your local area! 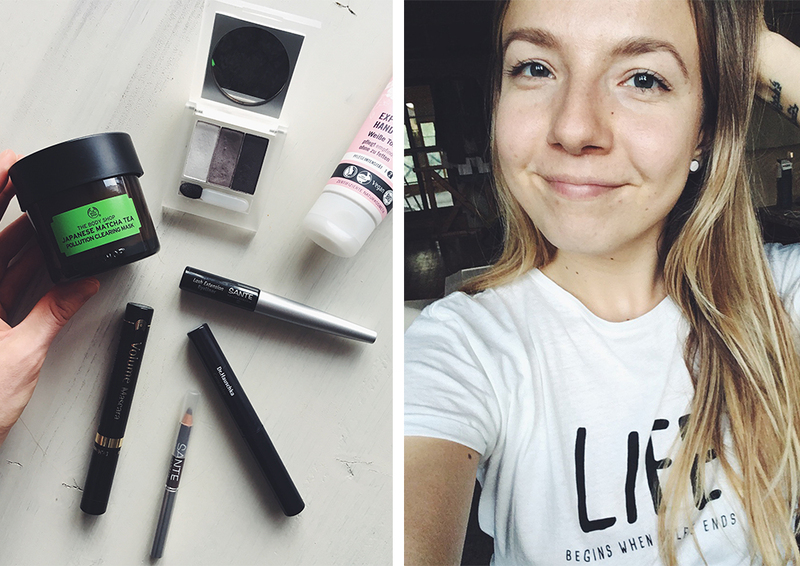 In the photos below: my minimalist & cruelty-free beauty products. So here you have it – 5 biggest vegan struggles and how to overcome them. I really hope you found this post helpful! All of your posts are so well thought out! The time you take with what you write really shows your passion to help others! Thank you for taking the leap and following your heart. It is impacting many people! I’m so happy to hear that things are taking a positive turn, Jacquie! 🙂 I know how lonely it can be. I was there too. What has helped me is enrolling online communities. Whether it’s on Instagram or Facebook groups, there are many supportive vegans out there. 🙂 Best of luck! Liz, thank you so much for the kind words. 🙂 It’s always the most incredible feeling to hear that someone has caught a spark of inspiration from my articles or recipes. And it’s amazing that you cook for your vegetarian or vegan family members! They’re very lucky. 🙂 Best wishes! You’re most welcome, Zane! Glad you found this post helpful. 🙂 Best of luck! In the US the best Vegan & cruelty free makeup/beauty brands I’ve discovered are also very cost effective (affordable). Wet-N-Wild, NYX, Bautista (may have spelled wrong but the have a great line of dry shampoo), Daily Defense, & CVS beauty 360. Daily Defense is an awesome line of shampoo, conditioner, & soap. It’s the first one I’ve found that’s cruelty free, sulfate free, & silicone free in every product. They use only natural oils & plant based cleansers. They don’t dry out my hair even when I forget to condition, my hair still looks good. Down here in South Texas, I can buy most of their line for $1 or less. I love it. I’ve always like Wet-N-Wild for their great quality & low prices. A few years ago they started actually labeling their stuff vegan & cruelty free. Thank you for sharing these brands, Adrianna! 🙂 This will be helpful for many people. And the price is really amazing! Here in Latvia, almost all vegan beauty products are quite expensive. This is new to me, thanks for sharing, Hera!